It’s time to look at a pretty recent shark film known as The Meg. This one definitely had an interesting trailer for the most part although it definitely seemed to shift in tone quite a bit. For the most part this film takes itself seriously but always keeps a light tone throughout. It makes enough mistakes to keep it from being a good film, but does avoid the critical error involving a dog that could have been tricky. The film starts off with a group of divers heading lower than they’ve ever gone before. They’re in a submarine so at least they feel pretty safe against the elements. They are a part of a group that is being funded by a billionaire known as Jack. Unfortunately they are attacked by a giant shark known as Meg. There is now no way to bring them back up so the team is forced to call in former expert Jonas. Jonas quit because of an incident where he was attacked by a giant shark and was only able to save most of his team. Well, they want him to go back in the ocean again, but can Jonas really face the same beast twice? Meg is one of those movies where the plot gradually changes as the film goes on. If you watch the trailer before seeing the movie you can guess what the final act will be as you are waiting for the scene to happen for a very long time. The movie is pretty fun. There’s good pacing and the plot is certainly engaging. While the cast isn’t amazing, they’re better than what I’d consider to be the average for this kind of film. I may as well say up front that the film did a great job in saving the dog. There’s a scene where you think it may be all over for the little guy and it was going to be over for the film’s score as well. Fortunately that didn’t end up happening which saved the film 2 stars I’d say. Now that could work as a jump scare, but I still think films should mainly avoid the animal angle. Of course, it does put the film in a dicey predicament as the main villain is an animal. How do you stop Meg without injuring her? Well, the quick answer is that you can’t and that limits the film’s potential from the start. Naturally I’m rooting for Meg the whole time because she is just trying to live in a tough world. It’s the pesky humans who keep getting in her way all the time. Meg makes for a good antagonist. She’s pretty huge and certainly vicious. Meg puts up a great fight throughout the film. While the film’s theme is nowhere near as hype as the classic Jaws tune, the movie does its best to give Meg a theme as well. It works reasonably well in setting up the tone for her scenes. The effects are solid as well. Now lets talk about the human characters. I thought Jack was a pretty solid character. The billionaires in these films are always a lot of fun. Of course, you get the feeling they’re gonna die as soon as they appear since that’s pretty much a staple for this character type. Well, at least his scenes are very memorable throughout. He’s constantly talking tough and for the most part thought things through well. He just got a little sloppy by the end. I also don’t see how you can trip in such a situation, but it felt like all the characters in this film were constantly tripping. I guess the boats can be slippery. Jonas makes for a good lead. Contrary to Dr. Heller’s assessment, he made the right call when leaving the ship in the intro. I thought that should have been obvious when the whole thing exploded seconds later. They all would have died. Jonas still goes back to help everyone out even though he isn’t particularly thrilled at the prospect. He tackles all of the tough jobs including using himself as live bait. I do think the heroes started stretching their luck with some of the plans though like having him swim towards the shark and launching a tracker. From that close distance in all likelihood Jonas would have been doomed. It’s basically a suicide mission but the characters don’t act like it’s that dangerous. So, the writing can be a bit dicey at times, but it isn’t terrible or anything. Another instance of bad writing it one of the side characters. He’s basically only around to crack dicey jokes and is one of the first guys to go. He’s another guy where you know he is doomed from the start. He doesn’t add anything to the film and that’s certainly worth noting. The main heroine is good though. Suyin is always ready to jump into danger and is the first one on the rescue mission to help the stranded divers. Her daughter also gets quite a bit of screen time. She can be a bit iffy when trying to play matchmaker but definitely knows a lot about the sub. It’s always good to start learning about tech and such at a young age. 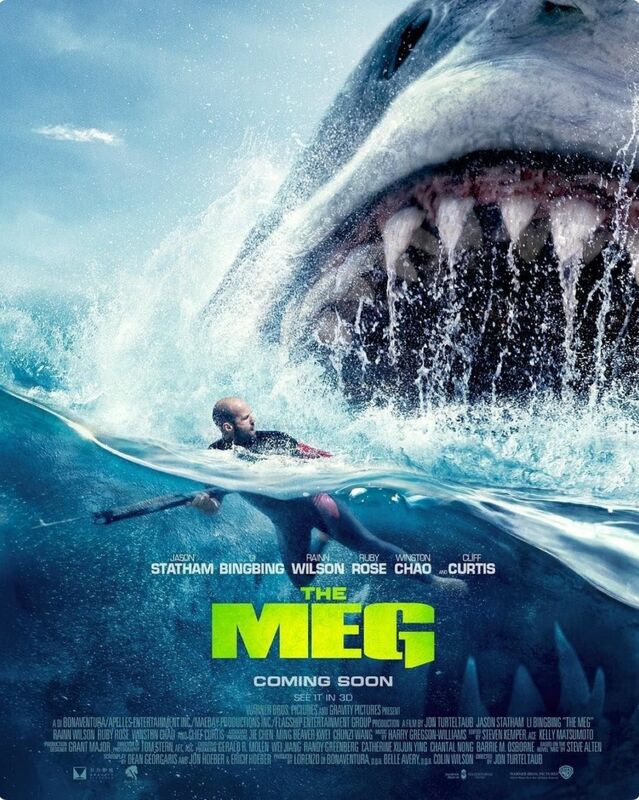 Overall, The Meg is an action film that delivers on everything it promises. There are some films where you basically know exactly what you are getting into from the start. This is one of those movies and that’s not a bad thing. The film’s consistent. It still lost a lot of points for animal violence and a dicey script, but if you’re not someone who minds the animal violence part then you’ll probably enjoy the film. The action scenes are on point and Meg definitely lives up to her hype of being a huge shark.